Hyro Da Hero, now here is an interesting musical proposition to match an equally intriguing name. Fusing rap and hip hop with rock isn’t exactly something new, but as the Houston native, but now L.A based Hyro Da Hero will tell you “no one has done it like this. It’s raw, and it’s real.” Adding some real rock credibility and authenticity to the album Hyro has enlisted producer Ross Robinson (Korn, Slipknot, At the Drive-In) and assembled a super group of musicians comprising of former Idiot Pilot guitarist, Daniel Anderson, Bassist Paul Hinojos (At The Drive In/ Sparta/ The Mars Volta) and Blood Brothers Cody Votolato (Guitar) and Mark Gajadhar on Drums. This isn’t just an album that samples rock music and overlays it with raps and rhymes, this is an album that offers live, raw and real rock. An album that I think will appeal more to rock fans than rap and hip hop fans, the 11 tracks are an explosive cocktail musically and lyrically. Which is an interesting observation of mine given that the album would have more hip hop styling’s than rock, but perhaps it’s because the rock fraternity are likely to be a little more open minded to this album than hip hop? In a rock sense it’s full of anger and intensity and comparisons to Rage Against The Machine can’t help but be made on a track like Ghetto Ambience. On tracks like Man In My City and System Overload it’s a full blown hip hop assault, whilst one of my album highlights We Still Popular delivers some mighty hard rock riffs and lead guitar breaks. Hyro Da Hero has a story to tell and both lyrically and musically on Birth, School, Work, Death and he does that in an authentic way. 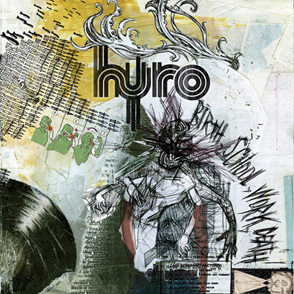 With the likes of Kerrang Magazine ranking Hyro in the Top 50 Greatest Rock Stars today and having performed at the likes of the iconic Download Festival, Hyro certainly has been embraced in a general sense. This album won’t appeal to everyone, but if you dig the whole rap rock thang, then this could very well be one of the best things you have ever heard!